"Will you help me to defect?" It's the desperate question from Russian ice dancer Mikhail Kozlof to his American counterpart, Kerry Niles, that ignites a treacherous cross-country trip, political intrigue ― and an attraction that neither can deny. Once sequestered in a safe house outside Washington DC, Mikhail is faced with an impossible situation―he must deny his love for Kerry to protect her from harm's way. Will he lose everything he cherishes? 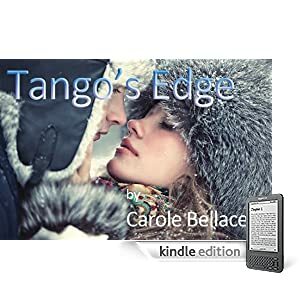 "TANGO’S EDGE is a thrilling tale from the very talented pen of Carole Bellacera, an author who is highly underrated. With scads of sexual tension and smokin’ chemistry between Kerry and Mikhail, it’s not long before the two start their own tango of the heart. Mikhail is a man any woman would want. Ms. Bellacera shows a flair for not only characterization, but incorporating Mikhail’s heavy Russian accent into dialogue. It’s not hard to actually hear the words spoken in your head as you read TANGO’S EDGE. Character development doesn’t end with the two main characters, however. Sean and Elena are a nasty duo only out to please themselves. Mikhail didn’t have much choice in partnering Elena, and she won’t stop until she gets what she wants -- the gold, and hopefully the puppy adoration of Mikhail. She’s the kind of woman who loves to have men at her feet, even if she kicks them to the curb when she’s done with them. It’s not what she can do for them, but what will they do for her? The applause startled her in the dark arena. It erupted into the silence after she landed the double axel, just as her blade’s outside edge bit into the ice with an audible scrape. Kerry Niles looked over toward the boards and saw the dark shape of someone watching her. Someone tall and male. Her brow furrowed in annoyance. Adam, of course. What was he doing here so early? Hadn't last night's argument sunk in at all? She'd made it clear how important this early morning practice time was to her. How she purposely set her alarm at four o'clock so she could get onto the rink before it began filling up with other skaters and coaches. “Is it six already?” she called out, knowing it wasn't. Her blood began to boil as she skated toward him. After last night's heated exchange, how dare he get here early? But as her eyes sharpened on the figure, she realized it wasn't Adam at all. Instead of dark brown hair, she saw the flaxen color, and knew it could only be one person. The man didn't speak but just watched her. Mikhail Kozlof, the male half of the Soviet ice dance team of Boiko and Kozlof, stood at the entrance to the ice. Like her, he was dressed completely in black, from his cotton turtleneck sweater to his skates. Last night during the compulsory dance competition, he'd been wearing white. Kerry's cheeks warmed at the memory of the moment he'd caught her staring at him in the warm-up area. But there had been no way in the world she could've dragged her gaze away from the arresting sight he made as he meditated before taking the ice with Elena. Eyes closed, he'd crouched near a wall, his back straight, arms spread-eagled at his sides. On another man, his sleek white skating costume might have seemed less than masculine with one arm encased in filmy white gauze and the other bare and off the shoulder. But as he squatted, motionless, in perfect balance, the sinewy biceps of his bare arm flexed, and Kerry had caught her breath at his magnificence. She wasn't sure how many seconds she'd stood there admiring him before he startled her by genuflecting, and then opening his eyes. Perhaps sensing her gaze, he’d looked straight at her. She'd been mortified, her face growing hot with embarrassment. But still she couldn't look away from him. Then he'd done something that had totally blown her away. He'd smiled. A warm, knowing smile that had sent the blood rushing through her body. Now, here she was staring at him again. Her cheeks were hot, her heart bumping. She was twenty-eight years old―ancient, almost, by amateur skating standards. But she hadn't felt this young and tongue-tied since she’d fallen in love with Adam at the naive age of fifteen. The Russian gazed at her with penetrating blue eyes. His cheekbones were high, his nose straight and Germanic. His golden hair was layered expertly away from his face, a bit longer in back. Under his right cheekbone, a faded scar traveled from below his eye almost to his ear. Incredibly, it didn't detract from his good looks, but rather, added character to a face that was almost too classically beautiful. How had he gotten that scar? With a start, Kerry realized he was speaking. Catching the irony lacing his voice, she grinned. “It means I don't land it that way usually. Hardly ever, actually. ” There. That sounded like the old self-assured Kerry. Kerry wanted more than anything to skate with him. Had wanted it since that first morning two weeks ago when she'd seen him here practicing with Elena. But it was crazy! She didn't know his routines. It was insane to think she could simply get on the ice with a complete stranger and move in sync with him. He turned and disappeared through the double doors. Kerry stood there, dumbfounded. He was gone only a moment. As he clomped toward her on his skate guards, music began to play from the PA system, and Kerry recognized the tango selection that all the ice dancers had performed to in the preliminary set pattern dances. Mikhail took off his skate guards and stepped onto the ice. Smiling, he held out his hand. She found her eyes locked on it. His fingers were long, his nails short. A silver ring glinted on his pinkie. Her heart tripped into overdrive. Somehow, without realizing exactly who touched whom first, she found her hand in his. But when he placed his other hand on her waist and began to guide her away from the boards, she stiffened at the penetrating heat of his touch. No…I don't…I can't… But the words were spoken only in her mind. She tried to relax and follow his movements, but immediately, her foot tangled with his, and she stumbled to the ice. The cold surface burned into her buttocks, and then her palms as she pushed against the ice to get to her feet. Heat rushed to her face as Mikhail grabbed her arm and pulled her up. How humiliating! Making a fool of herself in front of the best ice dancer she'd ever seen. But his ocean blue eyes were warm as he steadied her with his hands on her upper arms. Kerry nodded. He smiled and began to move. She was reminded of last evening when she'd watched him dance with Elena during the competition; she'd fantasized about being in her place. And here she was. As she relaxed in Mikhail's arms, she realized the routine they were doing was a basic set-pattern dance they'd all done in competition. She knew every step of it, and her mind automatically clicked into the mantra she used during competition. The tighter the curve, the deeper the edge. Yet, she was exquisitely aware it wasn't Adam at her side, holding her in his arms so confidently. Mikhail's scent washed over her, a mysterious combination of sandalwood and Eastern spices. This dance, sexual by nature, had never felt so passionate with Adam. By the second time around the rink, Kerry was dancing with Mikhail as if they'd been doing it forever. Their edges were clean and sharp, their leans elegant. Mohawks, Choctaws, three-turns. Every move they made was fluid, perfect. She found herself praying the music would never end; that she could hold onto this moment forever. She was dancing with a stranger―a foreigner, yet, she felt a sense of security and belonging like she'd never found anywhere before. Not since her childhood in Utah with her father and grandparents. But the music did end. Slowly, in the middle of the rink, Mikhail drew her to a stop. They stood, facing each other, hands entwined. The angles and planes of his face were shadowed in the dim light, but she felt the intensity of his gaze. An unbearable tension crackled between them, and Kerry knew the heat enveloping her had little to do with the exercise. For a crazy moment, she thought he was going to kiss her. Crazier still, she wanted him to. She knew nothing about this man from the former Soviet Union. Nothing except he was an artist on the ice, and the partner of Russia’s new hope for a gold medal, Elena Boiko. But for the moment, it didn't matter. He was a man, and there was no denying the electricity sizzling between them. And at this moment, she wanted to be kissed by Mikhail Kozlof more than she wanted an Olympic medal. His eyes, so stark, so earnest, scanned her face, moving over her brows, her cheekbones, and finally, settling on her lips. He leaned toward her, and Kerry lifted her face, offering her mouth.